Bourgeois' latest and greatest for players of all stripes at a price that can't be beat! Our product photos are the actual, specific serial number for sale! This specific item was photographed by us here in Durham, North Carolina. We are a very small team dedicated to providing you the most accurate photos possible, through our obsessive focus - individually photographing nearly everything that comes through the door. Questions about what you see? Want more information, photos, or just a friendly conversation with someone that cares and who has actually had their hands on this exact item? Contact us now! See something you like? This item is gone, but not forever. It can be special ordered, and even customized! We can get it fast! Because of our special relationship with Bourgeois we can get this as fast, or faster than anyone in the industry. In some cases, we even have preferred build slots we can offer you. Want to know when one lands? Want to discuss a special order? Hats off to Dana and his team--this is what the guitar world needs these days! A no-nonsense, no frills, worldclass guitar just as ready for the stage as it is the couch. As usual with Dana, the little touches go a long way and reflect some serious thought on his part as far as what the average player is going to appreciate. That satin finish keeps both weight and cost down, the decision to torrefy the Sitka lends a great look and even better sound to the instrument, and the overall appointments and pre-installed L.R. Baggs Lyric just make this one a no-brainer. They're not going to be making too many of these--don't wait to grab one! 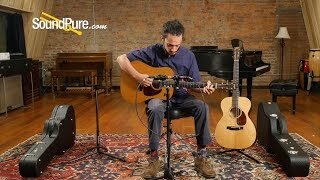 In this video, Sound Pure acoustic guitar specialist Barrett Brooks compares two models from the Bourgeois Generation Series. 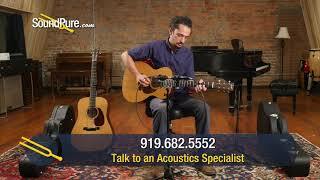 In this video, Sound Pure acoustic guitar specialist Barrett Brooks plays a Bourgeois Generation Series Dread acoustic guitar. Dana Bourgeois has been building guitars for nearly 40 years. He is known around the world for his superb craftsmanship and as one of the foremost authorities on the voicing, selection and utilization of fine acoustic tonewoods. Dana’s reputation as a master luthier has brought people from around the world to our door for a chance to work in our shop. The small, tight-knit group of craftspeople are proud of what they do and work hard to build the best guitars they can. Bourgeois Guitars are defining the future of vintage tone, combining old-world hand-voicing techniques with modern innovations in design and materials. Built in a ca. 1850s mill in the industrial town of Lewiston Maine, master luthier Dana Bourgeois and his small team of highly skilled craftsman produce some of the finest steel-string instruments available today. Known for tonal excellence, meticulous craftsmanship and top-notch materials, they are played by six-string luminaries such as Bryan Sutton, Ricky Skaggs, Sean Watkins, Della Mae, the late Doc Watson and countless professional and nonprofessional enthusiasts. Bourgeois guitars have had a prominent role in the American steel-string guitar renaissance for more than two decades, helping shape acoustic music’s most recent rise in popularity.